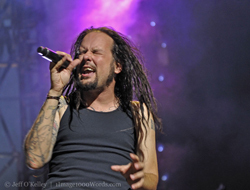 (New York, NY): In what promises to be the hottest tour of winter 2011, Korn and Disturbed, two of rock’s biggest acts, are teaming up to co-headline this year’s “Monster Energy Music As A Weapon 5 Tour”. “We’ve both just finished great tours. We headlined Mayhem and Disturbed headlined Uproar. The Disturbed guys came out to see us play in Chicago and we got to talking about doing something together. We both agreed that as cool as those types of tours are, they usually only hit major markets, and we both agreed that a lot of our fans just don’t live in those cities, etc so we thought it would be cool to team up, put a big show together, and hit every great place that those big tours never get to. Besides all that, with us and Disturbed together, doing full shows with full production…all I can say is IT’S ON!” …said the excited Korn frontman. “We are thrilled to launch the Monster Energy Music As A Weapon 5 Tour with our good friends from Korn,” added Disturbed singer David Draiman. “Every year we try to up the ante, and this year, by having Korn co-headline, we really think it’s going to be our best tour yet. When the idea first came up, one of the main things both bands agreed upon and wanted to focus on was hitting a lot of smaller markets. It’s exciting to bring a show like this to cities that are usually skipped over on some of the other larger rock tours that only hit the major markets. We have a lot of loyal fans in these cities and we wanted to bring them a show that they deserve”. Tickets for the first leg of the tour are set to go on sale the weekend of December 4. The bands have decided that the first 1000 tickets from each show will be sold at a $5 discount during the on sale weekend in order to reward the early buyers and fans. “A lot of promoters only offer discounted tickets a day or two before the actual show date. We wanted to do something for the fans that are buying their tickets as soon as they go on sale. To offer a discount upfront made the most sense to us,” commented Disturbed guitarist Dan Donegan. “We’re tired of promoters offering discounted tickets to last minute folks in order to sell the seats in the back of the gig. We’d rather give our fans a discount for buying early,” said James “Munky” Shaffer, who is Korn’s guitarist.